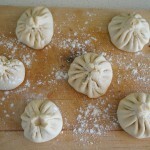 Khinkali are Georgian dumplings, but also popular in Armenian and Azerbaijani cuisine. Eating Khinkali is an art – using only your hands, hold the handle with the your fingers, then biting the pocket. You aren’t supposed to use a knife or fork, since it will release all the broth. 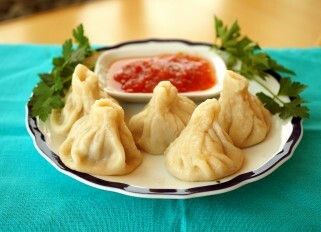 This is what differentiates it from pelmeni. For the stuffing its best to use lamb, but if necessary can be replaced with pork (200g) and beef (300g). The meat should be finely chopped, but you can use a meat grinder with a rough grind if its easier. 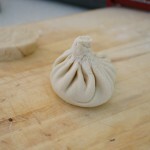 To fold khinkali is a skill. The more folds of pasta dough there are, the higher the skill of the master. But it must be at least 16-20 folds! Eat khinkali hot, almost burning, without sauce, just sprinkle black pepper and serve with cold beer! 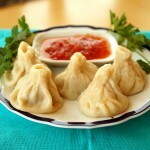 They can be served as a snack from a street stall or as part of the classic Georgian table. More photos making Khinkali with my kids. Knead the dough first: mix the flour with water, salt and vegetable oil, and knead the dough for about 15 minutes. The dough should be elastic, smooth and gentle. If the dough sticks to your hands, add a little more flour. Cover and let stand for 15-20 minutes. 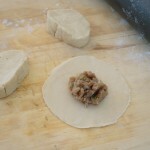 Prepare the filling: mix and knead together the finely chopped or minced meat with chopped onions, herbs, spices. Add salt and pepper, add the coriander, mix thoroughly, slowly pouring water that will form the broth. Divide the dough into 3-4 pieces, roll each piece into a thin rope and cut into small pieces and form each into a circle about 15 cm. On each circle put the meat filling in the center, about 1-2 tbsp. Gather up the edges of the dough to the center over the filling with both hands and pinch neatly together, slightly stretching the dough to remove as much air as possible. You should get about 16-20 folds but the more the better. Cook khinkali in a wide pan filled with lightly salted boiled water for about 12 minutes. Remove from the water using a skimmer. Serve with black pepper.